“I always knew hell would be hot, but I guess I didn’t expect I’d be holding down dog.” This was the thought running through my head in February of 2011. I was living in New York City, and rather than joining an expensive gym, I would buy Groupons for work out studios, attend one or two classes, and never return. One such Groupon was for a yoga class. One overcrowded room and several uppity and unapproachable yogis later, I walked home, shivering in the New York winter air, sweat frozen on my clothes, and fully convinced I would never again take a yoga class. Fast forward to January 2015 in Indianapolis. I had been running, playing on a soccer league, and attending boxing classes, and thought I could benefit from a low-key once-a-week donation yoga class to stretch out my muscles. I started looking for a place to do drop-in yoga once a week; not have to belong- just be an anonymous face in a crowded class to stretch at the end of the week. I chose the wrong place, and I’m so happy I did. Practice Indie is Shannon Brasovan‘s lovely brain child. A former corporate nine-to-fiver turned badass yoga instructor, Shannon has a gift for teaching yoga to those who thought they hated yoga (read: me). My first yoga class was a Sunday night donation yoga class. Shannon played Beyonce over the speakers and wore a shirt that said “I’m actually a mermaid”, and all of my negative thoughts about yoga disappeared. Shannon’s sincerity in thanking me for attending class and her memory of every participant’s name was impressive. After a couple of Sunday donation yoga sessions, I approached Shannon about a membership for two classes a week; after a month, I upped my membership again. So how did Practice Indie turn a yoga-hater into a yoga advocate? Start with Practice Indie’s motto of “You Do You Yoga.” If you want to come in and stretch it all out, great. If you want to do headstands in the middle of the room, do it. If you want to come lay in child’s pose for 45 minutes, GO FOR IT. Shannon and her team are extremely talented, yet approachable teachers. Practice Indie peppers in some laughs, a few expletives, and an all-around attitude of acceptance in their classes. That’s not to say you won’t have a seriously great workout. There’s a perfect balance of introspection, spiritual connection, physical practice, and fun. So even if you thought you hated yoga, and even if you can’t touch your toes, I encourage you to check out Practice Indie. Let them change your mind. As Shannon put it, “yoga should help you find your bliss. Learning, loving and laughing. Maybe a little crying. Whatever can bring you to a space of peace.” And who among us doesn’t need a little peace? 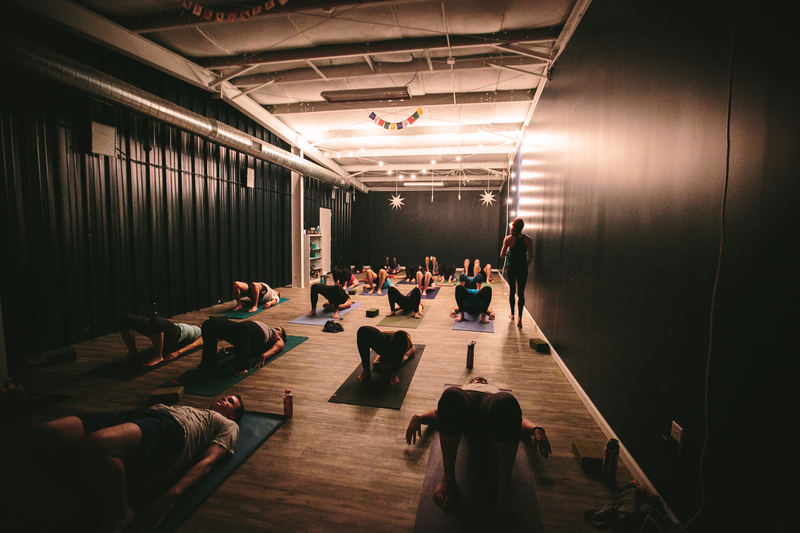 Check out ​Mindfulness on Tap, beer + yoga on May 19, a fundraiser that benefits Mighty Lotus. Go to mightylotus.org for tickets and info. Awesome to read such a positive article about my home town Indianapolis. I am still a Hoosier know matter where I have lived. In joy and I am taking yoga a that J in Birmingham.